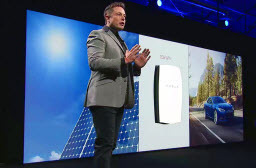 In late April, Tesla [Motors] announced their entrance into the energy industry with a new brand - Tesla Energy. As part of the announcement, they unveiled a new line of stackable lithium-ion batteries aimed at homeowners, businesses and industrial spaces. They also introduced a larger, infinitely scalable industrial battery which could potentially be used by utility companies. Many industry observers were surprised and excited that the Tesla product is priced lower than any competitor on the market. But what kinds of changes are really possible? And are they possible in New York? While the Tesla batteries are being marketed as costing under $4,000, or 50% less than the price of comparable products, the quoted price doesn’t include installation or a DC-to-AC converter. The actual cost of an installed system is much closer to $6,000-$7,500 ($600 to $1,070/kWh). Many of the consumer benefits are highly dependent on the rate structure for a given customer and special programs which may or may not be offered by a utility. Residential customers will typically see far fewer incentives to invest in battery storage than many commercial customers. As with many new technologies, the policy incentives and rebates offered by state authorities and utilities will greatly influence the financial considerations and rate of adoption. One thing Tesla Energy’s announcement doesn’t focus on, is integration into the grid and the potentially significant challenges that presents. However, Musk estimates that full market potential can reach 2 billion batteries sold – the same number of automobiles currently on the road across the globe. Con Edison is already looking at battery storage and working on what integration to the grid might look like. Last month, more than 200 middle and high school students converged at the Smithsonian National Museum of the American Indian in downtown Manhattan to showcase their semesters of action as part of their involvement with Generation Citizen. Students presented on issues ranging from youth employment and park safety to community policing and college access. Generation Citizen works to ensure that every student in the United States receives an effective civics education, providing them the knowledge and skills necessary to participate in our democracy as active citizens. 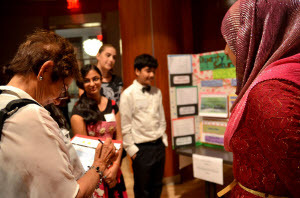 Each semester, student representatives present their work at Civics Day, where they share their action projects with fellow Generation Citizen classes, elected officials, and other community leaders. Highlights from Civics Day include two classes working to solve local issues. The first group, a class of 12th graders from the Bronx High School for Law and Community Service worked to address the drop-out rate at their school, particularly among immigrant students. Campus surveys, meetings, and discussions suggested that students who were new to America were grappling with language and cultural barriers. The class decided to create a near-peer mentoring program within the school, matching bilingual immigrant upperclassmen with at-risk freshmen and sophomores, to support underclassmen in setting themselves up early for academic and social success. They are now working with administrators in hopes of launching a pilot program next year. A second Generation Citizen class from I.S. 230 in Jackson Heights, Queens focused their attention on improving pedestrian safety on a dangerous road near campus. From their research, students discovered a new bill being proposed by a Queens city councilmember which would exempt MTA bus drivers from a law which penalizes drivers who fail to yield to bicyclists or pedestrians who have the right of way. Students presented testimony and their concerns to their local Councilmember and worked with other Generation Citizen classes and local transit-focused nonprofits. They targeted the bill's sponsor and other members of the Council's Transportation Committee through letters, petitions, and emails. Students are continuing to lobby against this proposed legislation. With support from Con Edison, Generation Citizen's students are taking action on important community issues today and are developing the civic knowledge, skills, and motivation necessary for a lifetime of engaged citizenship and leadership. As lawmakers shuffle through the final weeks of the state legislative session, observers are predicting relatively little action on all but three “must-do” issues: renewal of the 421-a Property Tax Exemption Program for housing development in New York City; mayoral control of schools; and New York City rent control. Meanwhile, legislation is also being considered by the State Senate that would order the New York State Public Service Commission (PSC) to study and release cost estimates on their Renewing the Energy Vision (REV) plan. The 421-a Property Tax Exemption offers tax abatements to developers for up to 25 years on the condition that they make 20 percent of the units affordable. The program was initially established in the 1970s, when New York City officials were concerned that residential construction was dropping as many residents moved to the suburbs. The city then decided to give property tax breaks to any newly constructed housing development, with some requirements of an 80/20 split to cover affordable housing. The upcoming expiration of the 421-a program has lawmakers, builders and housing advocates searching for a more effective way to create affordable housing. Mayor de Blasio would like the tax break extended from 25 years to 35 years in exchange for even more affordable housing — a hallmark of his mayoralty – but left out a requirement that construction workers be paid a prevailing wage. Governor Andrew Cuomo has called that approach too friendly for developers, saying worker protections must also be built into any agreement. Adding to the debate on housing policy for New York City, state lawmakers are also deciding whether to renew, weaken or strengthen rent regulations, which expire this month. The rules govern the rents landlords can charge for more than 1 million apartments in the city that house more than 2 million residents. Supporters say the rules ensure that New York City remains affordable to people of different incomes. But landlords say the rules unfairly restrict their business and can lead to higher rents on unregulated apartments. Many in Albany believe lawmakers will simply renew the law as-is with the deadline fast approaching. Meanwhile, Cuomo and de Blasio spent time in May sparring over how to extend mayoral control of schools, until recently coming to an agreement on a three-year extension. Cuomo and the Assembly Democrats have long sought to extend Mayoral control for three years, while Mayor de Blasio had initially asked to extend it permanently. State Senate GOP Majority Leader John Flanagan has floated a proposal that would extend mayoral control of New York City schools for just a year in return for lifting the cap on charter schools. Flanagan (R-Suffolk County) and Senate Education Committee Chairman Carl Marcellino (R-Nassau County) have introduced a bill tying the two issues together. Flanagan’s bill would place new mandates on the mayor and school system to provide reports on how funding is distributed to individual schools and per pupil. It would also require the city to submit an education budget plan to the state budget director and legislative leaders for approval and to make the city Education Department’s other info available online and to state leaders. Flanagan wants to increase the current statewide cap on charter schools to 560, up from 460. The bill would also remove any caps placed on charters in other areas of the state. Finally, Senator John DeFrancisco of Syracuse, chair of the finance committee, is sponsoring a bill that would force the state to provide a cost analysis of the Reforming Energy Vision plan within a year. REV, the PSC says, is an attempt to change the energy grid to connect more renewables and incorporate more efficiency and technology. The bill appeared following a public hearing in May, where DeFrancisco and other senators pressed state energy officials for specifics on how REV would save consumers money. Richard Kauffman, Chairman of Energy & Finance for New York State, and Public Service Commission Chairwoman Audrey Zibelman, testified that REV would eventually save billions of dollars every year by making the energy grid more efficient. They said that investment decisions for the grid are usually made to meet demands of the summer months, driving up costs on facilities that are usually only used a few days each year. REV would decrease demand and eliminate the need for some of the most costly facilities, they said. Had the chance to volunteer yet this year? 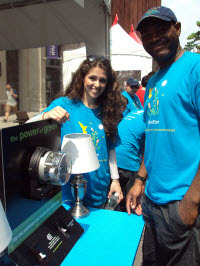 This spring, Con Edison’s volunteers could be seen all over the community. To date our volunteers have given over 3,200 hours of time and service. Volunteers cleaned out the Gowanus Canal, helped students discover energy at the World Science Festival and helped Habitat for Humanity Westchester build homes for families. The volunteers have also been snapping photos of all the work and fun they’re having - check them out and see how your colleagues and friends are giving back. Be sure to also visit the volunteer website for upcoming opportunities.